When printing in color, BCI-11 Color ink and a BCI-10 Black ink are both needed. Using these two ink cartridges will allow the printer to create an enormous scale of colors to produce bright, vivid graphics. 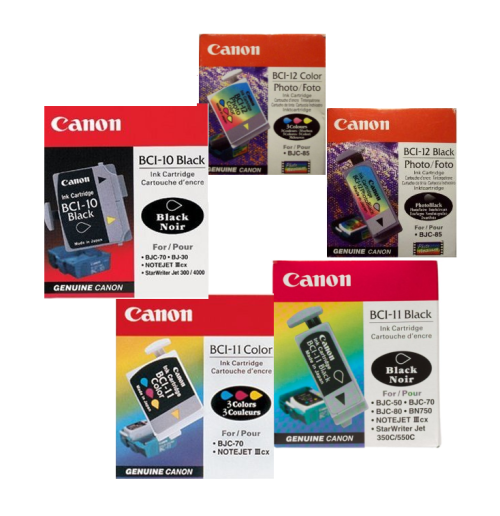 For monochrome printing only, your best option is to remove the BCI-11 Color and BCI-11 Black ink cartridges and install the BCI-10 Black ink cartridge. The BCI-10 is larger in size, taking up the same amount of space as two BCI-11 cartridges, and producing black-and-white documents that exceed average quality standards for monochrome printers. When printing photos, use BCI-12 Color ink and BCI-12 Black ink. This specialty photo ink can create photographs that are detailed, accurate and true to the original. Though it will look the best on photo paper, using the BCI-12 for any photo printing will elevate the quality level that could be reached using BCI-11 ink. Though changing these Canon ink cartridges might seem like a grueling task, the actual process is quite simple. Remove the new cartridge from its package, as well as all of its protective materials which are the orange cap and orange tape. Lift the top cover and press the “power” button. This will turn the printer on. Open the cartridge cover button on the printer and press the “cartridge” button and move the cartridge holder to the center of the printer. Align the triangular marks on the cartridge holder and the cartridge. At a slight angle, set the cartridge in the holder. Press down gently on the raised left side of the tank until it locks into place. When you have done all the steps, you can close the cover and press the “cartridge” button. Going back and forth between these ink cartridges if they are continuously installed and removed (like from color to monochromatic) can reduce the tank’s life, so it is best to do it as infrequently as possible. With the BJC-55 and BJC-85, it can seem cumbersome to swap configurations for different types of printing, but the finished product is worth the effort.